Chanteur Rock 'n' Roll US, Tex Montana a enregistré chez le petit label C.Way Records de Norfolk (Virginie). Il était accompagné par les T.V. Cowboys. 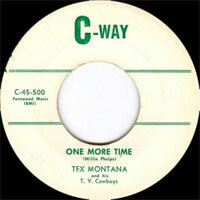 US Rock 'n' Roll singer, Tex Montana recorded at the small label C.Way Records of Norfolk (Virginia). It was accompanied by the T.V. Cowboys.